Coupure 30, 8000 Bruges, Belgium. 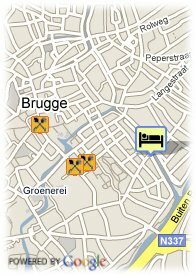 Hotel Rosenburg is situated near one of the charming canals at walking distance of the centre of Bruges. The spacious hotelrooms, mostly with a view on the yacht harbour of Bruges and the adjacent green city fortifications, offer all modern comfort. In the morning a delicious breakfast buffet is offered in the greenhouse with view on our rose garden. After a day of exploration in Bruges you can conclude your day in our most comfortable hotelbar of dine in one of the charming restaurants in Bruges. 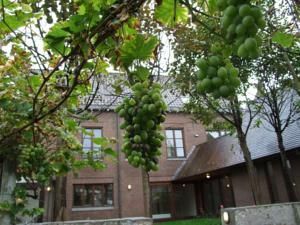 Hotel Rosenburg is the ideal hotel for a plaesant stay in Bruges. Parking fee required, Paid open air parking at the hotel (15.00 €), Free public parking near the hotel (open air), Reservation obligated. Park, Centre, Harbour, Museum Area, Near highway, Near the historic centre, River, Near shopping centre. More than 4 days before arrival : no cancellation costs. Less than 4 days and more than 2 day(s) before arrival: 1 night will be charged. The city of Bruges is one of the best preserved medieval cities of Europe. In the 14th and 15th century Bruges was the trading capital of Nord West Europe equal in size to London or Paris. Today the uncountable number of well preserved medieval facades in Bruges in gotic and renaissance styles, the numerous museums and a large number of cossy corners are the hart of a great shopping city with many quality shops. Come and enjoy Bruges: the "Venise of the Nord".